The chairman of the Meadowlands Racetrack, along with the Standardbred Breeders and Owners Association of New Jersey, applauded the New Jersey Legislature for allocating $100 million to horse racing purses over five years. But the industry will have to hit tough performance indicators to keep the money flowing. 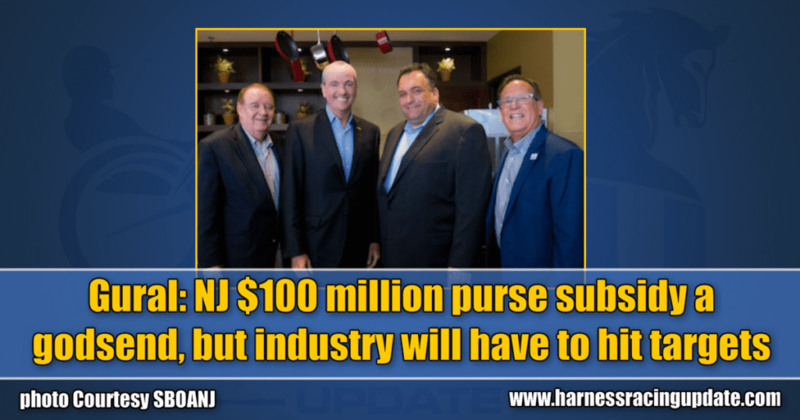 Meadowlands Racetrack chairman Jeff Gural said he was incredibly pleased the New Jersey Legislature passed legislation Thursday (Jan. 31) that could allocate $100 million over five years to augment horse racing purses in the state. “People have said to me today, ‘It’s a miracle.’ They never thought we would get it,” Gural said. “We got $20 million from the state budget to subsidize purses in New Jersey. That’s pretty good. Gulotta and the Standardbred Breeders and Owners Association of New Jersey (SBOANJ) was critical to getting the legislation passed. The subsidy comes with annual reviews and Gural said the industry would have to work hard to hit performance targets to keep the money flowing each year. “In order for us to get the $20 million a year, we have to show that the money has been well spent,” Gural said. “So, truthfully, in order for us to show increases in handle from what it was the last couple of years — because they are asking us to compare it to the handle over the last five years — we probably need to see our handle increase about $400,000 a night. That’s a lot. “Obviously, having new stallions and more mares bred will be looked at favorably, but they are also going to look at the handle to see if, in fact, having this extra money had an impact on increasing the handle by virtue of having fuller fields, better horses – all of the arguments we gave them for why they should give us this money. In a release, the SBOANJ applauded the New Jersey Legislature for passing legislation that was critical to the survival of New Jersey’s horse racing and breeding industry. The subsidy will be shared with the thoroughbred industry. The Meadowlands is expected to receive about $6 million annually from the subsidy, with Freehold to receive about $1.6 million. The SBOANJ release said, “the industry and horse racing and breeding farms not only aid and protect the preservation of open space in New Jersey, they heavily support the agribusiness and ensure thousands of jobs around the state. Without stimulation from the horse racing and breeding industry, these support businesses stop production and contributing to the New Jersey economy as well. This legislation will help to prevent this from happening in New Jersey. “SBOANJ is proud of the strides taken by our advocacy efforts. The relentless work of the Association will pay dividends for the horse racing and breeding industry and the State of New Jersey, enabling the horse industry to continue to grow and provide top of the line purses that will undoubtedly attract unparalleled competitors back to the state. SBOANJ is also appreciative of the support shown by their longstanding partners – the Meadowlands Racetrack, Freehold Raceway, the New Jersey Thoroughbred Horsemen Association and the Thoroughbred Breeders’ Association of New Jersey.